Torremolinos Hotels & Aparments Map. This Torremolinos Hotels & Aparments Map shows the location of popular Hotels & Aparments . Click the name in the right column below to highlight the location on the map. The well furnished Hotel Don Paquito is ideal for couples who want to enjoy its small, friendly atmosphere. It is situated on a t ree lined road close to the Playa del Lido beach and promenade, with shops and restaurants nearby. The modern Don Paquito is located 100 meters from the bustling promenade and sandy beach of Playa del Lido. Within 500 meters of the hotel, guests will find numerous shops and restaurants along the street of San Miguel. For those who like to venture further afield a public bus service runs outside the hotel. Places to visit include Aquapark 3 kilometers away with its dozens of slides and themed pools,offering a fun day for all the familiy. For those who like to play golf the nearest golf course is 4 kilometres away. A family run hotel, El Tiburon is a very friendly hotel offering simple accommodation and a warm and welcoming atmosphere. It is ideally placed for a relaxing stay, yet is within easy reach of the beach and waterfront promenade. The public rooms are pleasantly decorated and the well stocked bar offers a range of drinks and snacks. Due to the friendly and homely atmosphere guests return year after year. The Pez Espada has a prime beachfront location, great for strolling along the promenade to the lively Benalmadina Marina. It is a well established, relaxed hotel, particularly popular with mature guests. As a venue for local weddings, the main bar may sometimes be temporarily closed but there’s another available. 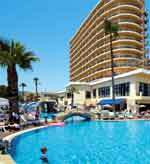 Many guests return to the Hotel Riu Belplaya year after year. It's a sociable hotel where staff and guests quickly get on first name terms with each other. Steps to the pool make it unsuitable for less mobile guests. the stylish Riu Nautilus makes a great hotel holiday hideaway. Right on Montemar Beach, there are also several traditional Spanish bars and restaurants in the locality. The Hotel Roc Flamingo is centrally located in the lively resort of Torremolinos, a stone's throw from the heart of the action. With a waterpark nearby, as well as organised nightly activities, you'll never be short of things to do. The Hotel Sol Aloha Puerto consists of three large blocks and overlooks the sea, with a few steps leading down to the promenade and beach. This hotel is set in an attractive complex overlooking the sea and promenade. The resort centre is 1 kilometre away and can be reached on foot, or by bus or taxi, although there are shops, bars and restaurants close to the hotel. Take a walk around the Sol Principe/Principito complex and the first thing that strikes you is the sheer variety of things to do. Enjoy your holidays in on of Torremolinos finest areas. All guest rooms, most with sea view, have fully equipped bathroom, telephone, piped music, in room safe, satellite TV and spacious terrace. Spend your holidays in a lovely quiet residential area in Torremolinos. A perfect place to spend a relaxing holiday. The hotel offers 122 rooms with air conditioning and heating, full bathroom suite, SAT TV, direct telephone and personal safe. The hotels amenities include a gym, sauna, jacuzzi, swimming pool for adults and children, 12.000 square meters of gardens, tennis court, volley ball and mini golf. In this hotel it is possible to enjoy all the comforts, like 100 rooms with complete bathroom with hairdryer, air conditioning, sat. T.V., direct dial telephone and safe. With wonderful views to the Mediterranean sea, the hotel has a swimming pool for adults/children, a sun terrace, a buffet restaurant, a cafeteria, the ronda lounge. This hotel also offers an entertaiment lounge, publi relations, rent a car and foreign exchange office, finnish sauna, gym and parking facilities. This hotel is provided with a modern fire detection. 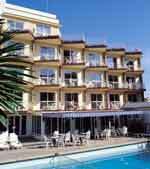 The hotel Marina Sur, is the most set in one of prestigious areas of Torremolinos. The hotel is close to La Carihuela, a typical neighbourhood known for its fish restaurants. 40 comfortables rooms equipped with TV, telephone, complete bathroom, terrace. Laundry service. Restaurant for 120 people. Special menu and a la carte. Buffet breakfast. Catering Traditional Spanish dishes. Hotel eh El Pinar offers 250 rooms and 130 apartments. Most of the single and double rooms as well as the junior suites provide unique views of either the mountains or the sea. Both the apartments and the rooms are equipped with terrace, telephone, fully equipped bathroom, satellite TV, air condition, safety box. The apartments are also equipped with kitchen and fridge. Services available are 2 Adult size swimming pools and one small swimming pool for children, Cafeteria, Restaurant, Restaurant Mesa³an (Spring/Summer), Cheer leading team (All year round). Pool side Bar ((Spring/Summer), Karaoke, Terrace Bar with night cheerleading (Summer). Free bus service to Torremolinos and to the beach, Private parking, Internet, Meeting and banquet halls, Gift and Souvenir shop, boutique, hair dresser, Money exchange and mail service. Sports facilities: tennis courts, paddle court, mini golf, table tennis, bike rental, gymnasium, sauna. Located in a leafy pine wood 800 meters from the center of Torremolinos. Opened all year round, the hotel provides its clients with a free bus service to Torremolinos' beach and city center. Small Andalusian style hotel, near the beach but very peaceful. 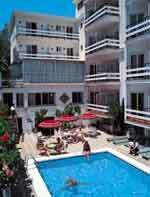 A small family hotel located in the heart of the Costa del Sol, fully refurbished in July 2004. Fifteen rooms, including four suites, all facing an Andalusian patio, with charming decoration, individual air conditioning, satellite TV and private parking facilities. One day excursions to Andalucia and Gibraltar are also available from the hotel. Comfort and tranquility are our most outstanding qualities. Spacious rooms with air conditioning and satellite TV. Daily cleaning, Bar and Parking.